Premium Compatible Label Tapes for the Brother P-Touch H100LB printer. Brother P-Touch H100LB is a lightweight, easy on pocket label printing machine. The machine comes in a blue color, weighs about 390 grams with dimension of portable handheld device 59mmX110mmX207mm (HWD). Brother P-Touch H100LB Label Tapes can print up to 3.5mm to 12mm (wide) labels. The maximum print resolution is 180 dpi, maximum print speed is 20 mm per second. The device is powered by 6 AAA batteries. Brother P-Touch H100LB features one font, nine font styles, three character size (small, medium, large), 177 symbols, seven decorative frames, auto designs and templates. It has an LCD display printing 12 characters in one line. There is multi line printing of two lines and up to nine copy prints. The device stores a label memory of 9 favorite labels. The unit carries a built in cutter and a tape cassette. As this label printer uses Brother P-Touch H100LB Label Tapes, therefore running costs are reduced. Brother P-Touch H100LB is another competitive label printing machine in Brother PT series. Like its other counterparts Brother P-Touch H100 and P-Touch H100R, the features it provide are more or less same. For effective and quick labelling at home and office spaces, this lightweight, compact machine can be a perfect fit. Suitable for all kind of users, whether male, female, children, old people or professionals, this label printing machine can be a good purchase for sorting and arranging stuff for an organized life. Q. What size is the Brother TZe-135 P-touch (White on Clear) label tape? A. The size of these tapes is 12mm. Q. Are Brother P-Touch H100LB Label Tapes (TZe-135 P-touch- White on Clear) able to withstand rough weather conditions? I need to do labelling of some objects in my lawn, so I need durable label tapes for very chilly and hot weather surroundings. A. Yes, these Brother tapes are designed to endure harsh weather conditions. Since they are laminated, the text doesn’t get faded, so you can opt for them to fulfil your requirement. Q. I’m planning to buy Brother TZe-135 P-touch Tape (White on Clear) in bulk for my Brother P-Touch H100LB handheld printer. I need to label products boxed in dark colour packages. Will these label tapes display text clearly and should I go ahead with their bulk purchase? Please advise. A. This white on clear label tape is a part of the high quality, well-constructed Brother P-Touch H100LB label tapes collection. It highlights text printed on it very clearly and will ensure that your dark coloured packages grab attention. These label tapes are also tough and durable, so there’s no harm in purchasing them in bulk and preserving for future use. Q. I read that these label tapes have been provided with a new crack and peel backing recently. Why this alteration and how does it help? A. The new crack and peel backing feature is a new addition to these label tapes. This technology makes applying the tapes to surfaces very easy and smooth. In addition to that, there will be no residue that will be left behind when you take it off. Q. Are Brother P-Touch H100LB label tapes available in different sizes and colours? A. Yes, they are available in a wide range of sizes and colours to choose from as per your needs. Q. 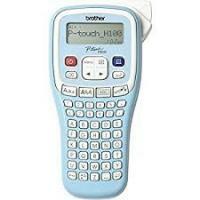 Can I know the dimensions of Brother P-Touch H100LB handheld labelling machine? Is it OK to print on Brother P-Touch H100LB label tapes with it? Also, does this machine feature 2 line printing? A. The dimensions of this labelling machine is 5.9 cm in depth, 20.7 cm in height and width of 11 cm. It weighs 390 g, which makes it pretty light. You can go ahead with printing on the P-Touch H100LB label tapes with it as it is well-suited for it. Q. Are Brother P-Touch H100LB label tapes laminated thoroughly? A. These label tapes are made employing laminate process that makes it completely resistant to UV rays, moisture and scratches. Their exclusive laminate process makes them very durable and resistant to extreme weather conditions. Q. I need a good label tape which doesn’t leave any sticky behind when peeled off. Will these label tapes be useful to me? A. Yes, these label tapes are designed to come off smoothly and not create any mess behind. Q. Can I avail of same day delivery of Brother P-Touch H100LB in case I need it on an urgent basis? A. Yes, a number of suppliers of Brother label printers offer same day delivery option for your convenience. Q. Does this labelling machine print using different effects and styles? A. This label printer machine offers you eight styles to print with. And it has high-quality feature such as built-in device, preview screen and others are provided to enhance the quality of your printouts. A. These compatible labelling tapes are available in a pack of five. You can purchase it for an attractive price and save big. Q. How many meters of this label tape is provided when bought in a pack? A. It is of eight meters length when bought in a pack of five.